Step 1. Cut a one-metre length of Paper Stripping. Step 2. Make a loop (approx. 12cm) at one end of the Paper Stripping. Pierce through the bottom of the loop with the pointy end of a skewer. Step 3. Continue to make loops over the skewer with the Paper Stripping. Pierce each loop through with the skewer. Make each loop slightly smaller than the previous one. Continue until you have used up the Paper Stripping. Step 4. Spread the loops evenly along the stick. Step 5. Roll a small ball of plasticine then insert the blunt end of the skewer to create the base of the tree. Stabilise the tree by pressing down the base. Step 6. 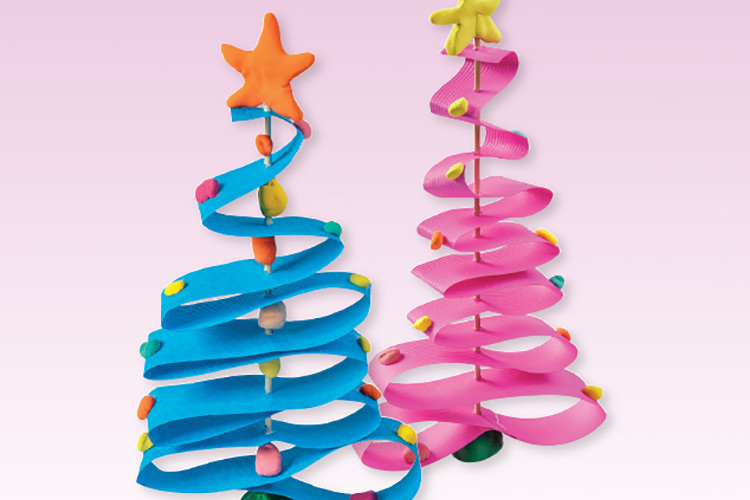 Decorate the tree with Magiclay shapes: Roll a ball of Magiclay. Pinch shape into a star and press on top of the tree. Press small Magiclay balls onto the Paper Stripping tree for decoration.